Learn more about the treatment process behind NIS. Cereal straws (and Hay stalks) are plant structures designed to support the weight of the plant itself, the flower and the seed head. The structural strength of the stalk is achieved by the plant cell walls being reinforced by lignin. Lignin is a hard ‘slightly woody’ material which is generally thought to be indigestible. Whilst there is a considerable amount of slow release energy, in the form of cellulose and hemie-cellulose contained within the cellular structure, much of it is unavailable for animal digestion because it is contained within the cells surrounded by lignin. The high lignin content of cereal straw (and ‘stalky’ hay) makes these materials to be of low feed value and unpleasant to eat. In order to improve the palatability of cereal straw it is normally chopped into maximum 2’’ lengths but many animals will not eat enough. First we chop and grind the straw into a coarse meal, then we add a very small amount of NaOH to it. NaOH is an alkali material which reacts with the carbon in the lignin, and forms a Sodium Carbonate salt similar to baking powder. During this process, the lignin becomes soft. Once the lignin is soft, the meal is extruded into pellets. The pelleting process squeezes the material very tightly, turning the original cellular structure into a non cellular mixture of cellulose, hemie cellulose and lignin. 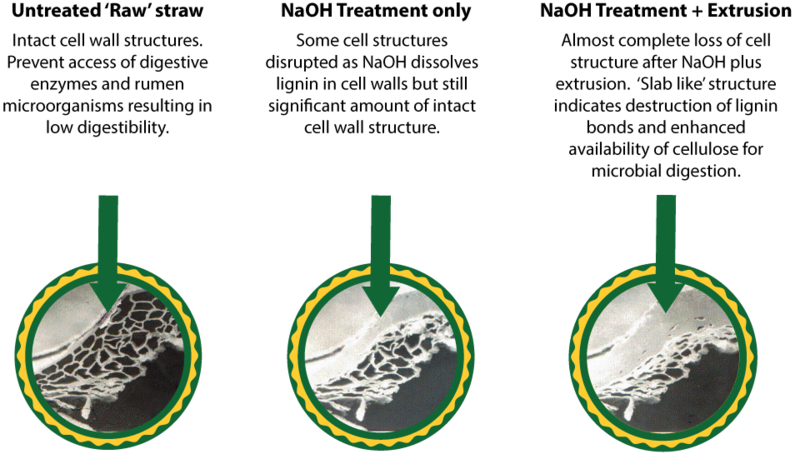 Our process replicates this process and so is often referred to as pre-digested straw.